March 28-June 26 – Sustain Me Baby: art exhibit at Projective Eye Gallery, UNC Charlotte Center City. March 28-June 26 – Is This Yours? 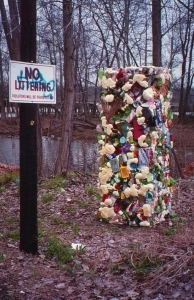 : art installations, calling attention to plastics waste, to be placed around Charlotte, from local artists Kurt Warnke and Nancy Pierce. May 9-July 26 – Stayin’ Alive: – art exhibit. Work by Aurora Robson at McColl Center for Visual Art. May 16 and June 13 – Clean Martini Screens – Join us for for film screenings, discussion, and clean martinis made by local distilleries from local products, as well as light locally sourced hors d’oeuvres. Henry Owen, program director for Friendship Gardens. Nicole Peterson, UNC Charlotte assistant professor of anthropology, and an affiliated researcher at the Center for Research on Environmental Decisions at Columbia University, and a leader in the creation of the Integrated Network for Social Sustainability. Mike Lizotte, the UNC Charlotte sustainability officer. Laurette Hall, Mecklenburg County Solid Waste, environmental manager of waste reduction programs. Meg Fencil of Sustain Charlotte, a local sustainability education and advocacy group that studied Mecklenburg’s recycling rate, comparing it with other cities. Sam Perkins, of the Catawba Riverkeeper Foundation, who will discuss the problem of trash, especially plastics, and how they affect our waterways. 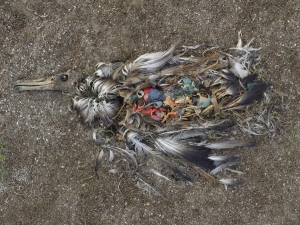 The bird is a photo by Chris Jordan, from his Midway series, which has images of the stomach contents of dead baby albatrosses, whose parents mistakenly feed them bits of plastic, which kills them.